Hisense are not a well known brand in the UK, but they’ve slowly been gaining traction by taking a similar approach to TVs that OnePlus take to mobile, they provide a great feature set at a reasonable price. The Hisense H60NEC5600 is a 60″ 4k LED TV. 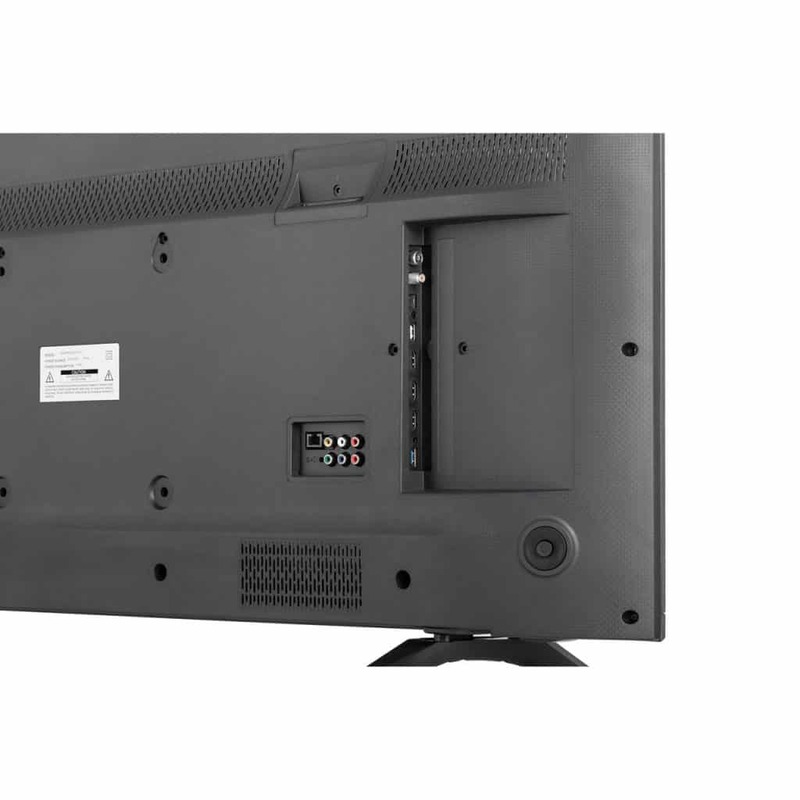 60″ is an unusual size, with most manufactures generally offering 55″ or 65″. For those wanting something larger than 55″ the 60″ size offers a nice step up. Coming well packaged, the H60NEC5600 comes with two bars you need to attached to stand this up, power cable, remote (batteries included) and a getting started manual. If you want to wall mount this you’ll need to source your own bracket. Around the back of the TV you’ll find the usual array of connections, including 3 HDMI ports, one of which is an Audio Return Channel (ARC) for outputting sound from your TV to a speaker system. All 3 ports support 4K, but only two of them support 60Hz, the 3rd is 4k 30Hz. Setup was very easy. Attach the stand, plug in your aerial, HDMI cables and Ethernet cable (if not using WiFi) and power it on. A short setup guide appears, once completed you’ll be ready to watch TV. Well almost ready. The out of the box picture quality isn’t great, there was a lot of clouding around the side of the screen, not noticeable when watching something filmed in bright light, but swap to something with a lot of blacks and it’s horribly distracting. You can massively reduce this problem by heading into the settings and turning down the backlight option, which by default is set to 100%. You’ll also need to dig about in the settings to make sure ARC is working correctly. Just setting the TV to use external speakers isn’t enough, you’ll need to make sure CEC has been set to active. The menu system could make this a little clearer, but once done you’ll be able to play Netflix directly on the TV and have the sound come out of your sound system. You’ll want to use a separate sound system, as with most TVs the inbuilt speakers work, but they don’t provide great sound, they are flat and lack any bass. If you’re going to invest in a good TV make sure to add a good soundbar or surround sound system to really get the most out of it. At 60″ standard definition video struggles to look good, HD images look great. Even the now ageing Virgin Tivo menus looks sharp and crisp. If you’re a gaming and have a smaller TV you’ll love the step up to 60″. The original Xbox One looked good, but the new Xbox One X looks fantastic, taking advantage of the 4k capabilities of this TV on games such as Assasin’s Creed Origins. The remote works well and it’s great to see Hisense have included 4 dedicated shortcut buttons for Netflix, Amazon, YouTube and FreePlay. Swapping between the services is quick and feels no different to turning over a channel, there is no length delay while the service loads up. If you’re use to using something like LGs air controller you’ll find the Hisense remote to be frustrating to use when entering all your account details for streaming services, but at least this tends to be a one-off occurrence unless you plan to use the in built web browers. The overall menu system is easy to use and feels very slick. There isn’t any lag when scrolling through the various menus and content loads quickly. You can customise the menu bar with your favourite apps, input selections or channels. Often it can be tricky to remember what input is for what, not so with the H60NEC5600, you’ve the ability to rename the input as you see fit, so instead of ‘HDMI 2’ it’s ‘Xbox’. If you have a Netflix account you’ll need to make sure you’ve upgraded to the Ultra HD 4K package (£9.99 per month at the time of review). Content in Netflix is marked as UHD 4K so you can easily find something to watch on your new TV. This is a great TV for the price. Yes there are some niggles with initial picture quality in dark situations, but overall this offers a lot of features for the price.